Existing customers, we didn’t leave you out of the savings! 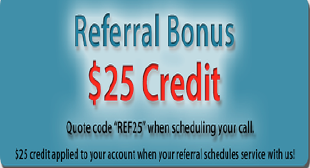 Simply refer a friend or colleague to Miami Mechanical Contractors and you will receive a $25 credit to your account for use on service, repairs or replacement. Please have them quote “REF25“, or simply drop your name when they call!